The NU Audio Card enhances the relationship to music and mood. Change the 10-Mode RGB to match your favourite colour, or use any of the four Audio Reactive Lighting options to let your audio set the tone and colour of the NU Audio Card lighting. Alternatively, simply turn the RGB off if you'd prefer to keep things dark. The analog section is responsible for returning audio without distortion and fine tuning the sound to ensure it remains as faithful to the source as possible. The digital side of the EVGA NU Audio Card is responsible for processing your source audio at the preferred format or converting the audio to and from analog, without affecting the internal makeup of the source audio. These components were chosen for their efficiency and resistance to adding artefacts during the process. Powered by specialised Audio Note (UK), Ltd. audio-grade capacitors and audio-grade resistors, your audio remains noise and distortion free as it passes through to your choice of speakers or headphones. The SATA connector receives 3.3V and 12V input directly from PSU, SMPS to convert from +12 to +/-16.5V, then to +/-14.5V and +/-5V. The input power is then fed into multi-stage regulation, including TI low noise IC at +/-14.5V and +/-5V. Lastly, dual-ground planes are used – one for analog, and one for digital – to reduce noise transfer. Audio Note Standard, Nichicon solid and Panasonic FC capacitors are extensively used, together with high performance MLCC types. All audio circuitry uses AN Standard capacitors in the power rails, and the method of multiple bypass pinning is used, where many smaller capacitors are used to pin the + and – rails relative to the ground planes. A USB-based solution was chosen because USB Audio class 2.0 is a highly developed standard in HiFi and Pro Audio, therefore allowing ideal implementation of device drivers to provide superior audio quality and low latency using our ASIO drivers or WASAPI. ASMedia ASM1042 PCIe > USB bridge: A highly reliable and compatible solution to provide onboard USB connectivity. XMOS xCORE-200 USB solution: XMOS, a UK-based semiconductor company, is widely regarded as producing the best USB audio solution available, used by high-end audio and Pro Audio manufacturers around the world. Low latency ASIO drivers were developed in house at EVGA in partnership with Thesycon, Germany. Graphic EQ DSP is carried out within the xCORE-200, minimizing stolen CPU cycles. One for 44.1kHz sample rate multiples, one for 48kHz multiples. These provide precise, low-jitter on-card clocking for the ADC and DAC sections and support asynchronous/isochronous operation, which minimizes jitter. It's often stated that 'bits are bits', but audio is a real-time, dynamic frame, such that it’s not just the bits that are important, but also their timing. Small, fluctuating errors in timing are known as jitter, which causes noise and distortion, and in ways not directly comparable to the analog domain. AKM AK4493 32 bit, 123dB DNR capable DAC solution, selected based primarily on audio quality. AKM technologies like Velvet Sound and advanced materials used in silicon, the lead frame, and chip packaging result in a superior sounding converter. Natively supports all sample rates from CD (16 bits, 44.1kHz), and up to 32bits at 384kHz in PCM and DSD2S6. The AK4493 provides a fully-balanced output for low noise/distortion operation, and fed to a fully-balanced, iteratively-optimised, linear phase low pass filter formed by Tl LME49724 fully-differential amplifiers, Audio Note resistors and Wima precision capacitors. The balanced signal is fed to the line stage itself, formed from an ADI AD8056 dual Op-Amp - selected for its audio quality - and seated in an IC socket for interchangeability— known as "Op-Amp rolling". The headphone amp itself is formed from an ADI OPA275 dual Op-Amp - mounted in an IC socket for interchangeability - together with two Tl LME49600 power amp ICs. The H PA output is direct coupled to the 6.35mm jack and presents an extremely low impedance to the headphone, reducing distortion and improving transient response. DSD is a one-bit format, and cannot be processed by standard DSP. Windows volume control, however, or all software digitally implemented volume controls work by DSP. DSD can provide better sound quality, but that does leave the problem with controlling volume. To make the headphone amplifier usable with DSD, software-controllable analog volume control for the headphone amplifier is implemented by a Maxim DS1882 IC — proven to have quality sound in a variety of audio equipment. The separate volume control also overcomes the issue with different headphone impedance and sensitivity. 1996 IEC 61938 standard recommends headphone amplifiers have an output impedance of 120 ohms. Here, the headphone power-amp is direct coupled to the 44 in jack, and a special circuit scheme is implemented to create high frequency stability ,and current limiting to 250mA suppresses damage on momentary short-circuit during jack insertion. The output impedance of the NU Audio card is a small fraction of an ohm. This results in tight, defined bass, and improved tone, especially those with rare-earth magnets which have a tendency to sterile tone. AKM AK5572, a 32-bit 121dB capable Analog to Digital converter to faithfully transfer your content to the digital domain. As with the DAC, this IC is equipped with AKM's Velvet Sound technology and selectable high-pass and low-pass digital filters. NU Audio provides a studio quality Line-ln interface, capable of recording at 384kHz if your PC and DAW is capable of handling the data rate. Input buffering is performed by a Tl OPA1652 dual op-amp, followed by low-pass filtering, and balanced drive to the ADC by Tl THS4551 fully differential amplifiers. This input is a very high-quality interface intended for use at the Line Level, for example, to record the output from a mixing desk, tape-recorder or external mic-preamp. The NU Audio card is equipped with another independent input, which can be configured for Line Level signals, or for Mic Level signals, and has an inbuilt software-level control to ensure compatibility with a wide range of sources without the use of an external preamp. The Mic-ln is configured with a Cirrus Logic CS5346 IC, which is 24-bit 192kHz capable, with a maximum dynamic range of 103dB. "EVGA enters the soundcard market with a card that is equally at home as the centre of a high end Hi-Fi system, production studio or high end stereo gaming setup. By teaming up with Audio Note, one of the highest esteemed names in the UK Hi-Fi industry, they have created a wonderful sounding card, with a powerful, full bodied tonal balance with an outstanding headphone amp that's both detailed and powerful, which will actually power even the most power hungry, high impedance headphones with headroom to spare. It's easily comparable to many high end external DAC units costing much more. The circuit design is optimised for sound quality rather than performance figures, the headphone amp for example, not having a resistor on the output, delivers much more power before saturation than the specs would have you believe. We were incredibly impressed as to how well it drove the flagship Audeze LCD-4 headphones to a good volume with detail that we would have expected from headphone amps costing many times the price. So why is Scan's pro audio division interested in what looks like a consumer card? Firstly it uses the same XMOS chip as many of the leading usb interfaces including Focsurite Scarlett & Clarett, Presonus Studio and Audient ID series, and shares the same ASIO drivers with similar low latency performance. For anyone who does electronic production with midi instruments or mix work, it's a fantastic choice, as the converters and analogue circuitry are very much in line with what we would find in top end pro interfaces. The headphone amp is above 99% of pro interfaces, it stands up extremely well against excellent Hi-Fi DAC/AMPs, with very similar detail and tone to the fantastic, but sadly now discontinued Audeze Deckard. This is normally the area that Pro interfaces do not give focus to, with them lacking detail and power to drive high impedance models, but Nu Audio is the total opposite of these interfaces, so there is no need to buy an additional headphone amp (starting at a similar price to the total cost of this card) for use with high end or high impedance headphones. The analogue input (albeit being on a 3.5mm jack) is incredibly quiet and well defined, incredibly well suited for uses such as sampling from vinyl, using a phono preamp or mixer. For anyone predominately doing headphone based electronic music production or mix work on thier PC, this card is simply superb value for money. *ASIO buffer size selection to be enabled in forthcoming update. The output from this card is on Hi-Fi industry standard phono connectors, but actually, the entire signal chain on the card is balanced right up to the phono plug connection for the lowest noise possible. Features • Passive copper shielded heatsink. • RCA Phono Line Out, 6.35mm Headphone, 3.5mm Line In, 3.5mm Mic In, S/PDIF Out. • PCIe Gen2 x1 interface. 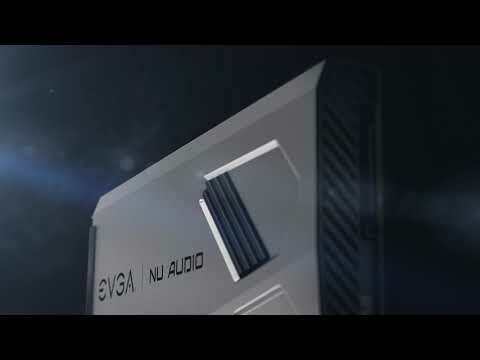 EVGA Nu Audio Internal PCIe Sound Card, Engineered by Audio Note, RGB, Headphone Amp is rated 5.0 out of 5 by 1. Rated 5 out of 5 by Kully1972 from clean and spacious sound with asio support Using asio output on foobar everything sounds cleaner and you get a deeper wider soundstage, more detail. The separation of instruments is very noticeable and you can hear the subtle layers of sampling in a track much clearer. The bass is tighter and deeper and more rhythmic. I love hearing the cymbals and drums on this sound card. Van Halen's 1984 album sounds more alive than ever. Overall the sound signature is very neutral and clean and is comparable to my external nu force dac hdp. As a long time audiophile I'm glad I bought this and has asio support built into the driver suite. Asio drivers are important as you decode at hardware level only. I'm wondering whether the SATA connection is required to power the card or is it just for the RGB lighting?